Sergio Garcia Look-alike is getting filthy rich from our filthy golf! Glenn Berger is making a mint from fishing golf balls out of the lakes that line the fairways of golf course-rich state, Florida. 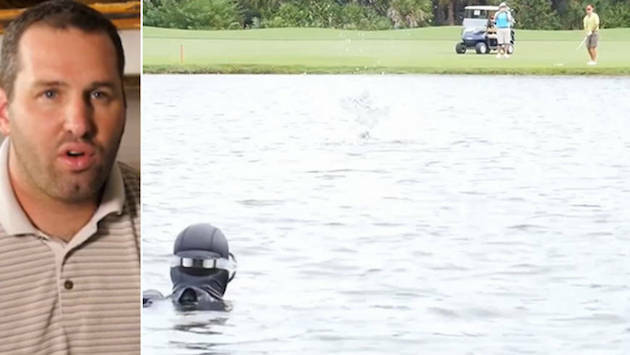 He was an out-of-work thief 14 years ago when the idea struck him to start diving for golf balls at the bottom of lakes and selling them back to clubs for use on their driving ranges. At a minimum of a $1 a ball — some are worth double that — Berger calculated he could make a pretty good living. More than a decade on he claims he’s now fishing out anywhere between 1.3 to 1.7 million balls a year, which equates to approximately $15 Million since starting his career. “I was partially unemployed and I was stealing golf balls out of a golf course lake where I lived and I realized that wasn’t the way to make money … this business just blew up,” Berger says. One of the most frightening experiences came in 2007 when a 2m long alligator crawled on to his back. Berger managed to escape without injury — and about 4000 golf balls.